On Aug. 28, skywatchers across much of North America canwatch as the Moon crosses into the Earth's shadow and will undergo its secondtotal eclipse in 2007. West Coastviewers will get the best show. Lunar eclipsesoccur when Earth gets between the sun and the moon, casting a shadow. The viewis different from each location on the planet. Along the West Coast of Canadaand the United States and in Alaska, the entire eclipse will be visible fromstart to finish before moonset in the early morning hours of that Tuesday.? Hawaiians will see totality – when the moon iscompletely in Earth's shadow – high in their sky around midnight.? In easternAsia and Australia, the event will occur on the same date but in the evening,since for this part of the world it will coincide with moonrise. The Moon willtrack across the southern portion of the Earth's shadow, and will be completelyimmersed for one-hour and 30 minutes, making this a much-longer than normaltotality. Because someof the sunlight that strikes our Earth is diffused andscattered by our atmosphere, its shadow is not completely dark; enough ofthis light reaches the Moon to give it an eerie copperyglow even when it's totally eclipsed. 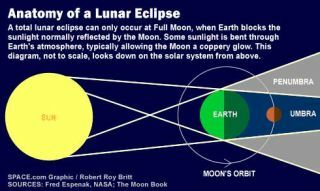 It is anticipated that duringthe upcoming total eclipse the Moon will glow brightest across its lowerportion, while its upper part (closest to the center of the shadow) will appeara deep shade of brown or gray. Foreasterners, the eclipse will begin around dawn and will still be in progresswhen the Sun rises and the Moon sets, two events that happen almostsimultaneously on a lunareclipse night. For theCanadian Maritime Provinces the Moon sets before total eclipse begins; be onthe watch for a thinning sliver of the Moon's edge going down just above thewestern horizon. Across the eastern United States and the Great Lakes States, the Moon sets during totality. In this region, depending on where you are locatedand just how clear your western sky is on eclipse morning, you might lose sightof the eclipsed Moon completely before it sets, since the twilight sky willstill be quite bright and the full Moon will be shining 1/10,000 as bright asit normally would; otherwise, you'll be hunting for a dim ball. Across theNation's midsection, the Plains and Rocky Mountain States totality has alreadyended before moonset and the eclipse is partial as the moon emerges from theEarth's shadow.? The next totallunar eclipse is scheduled for Feb. 20-21, 2008 and will widely visible fromNorth and South America, as well as Europe, Africa and eastern Asia.